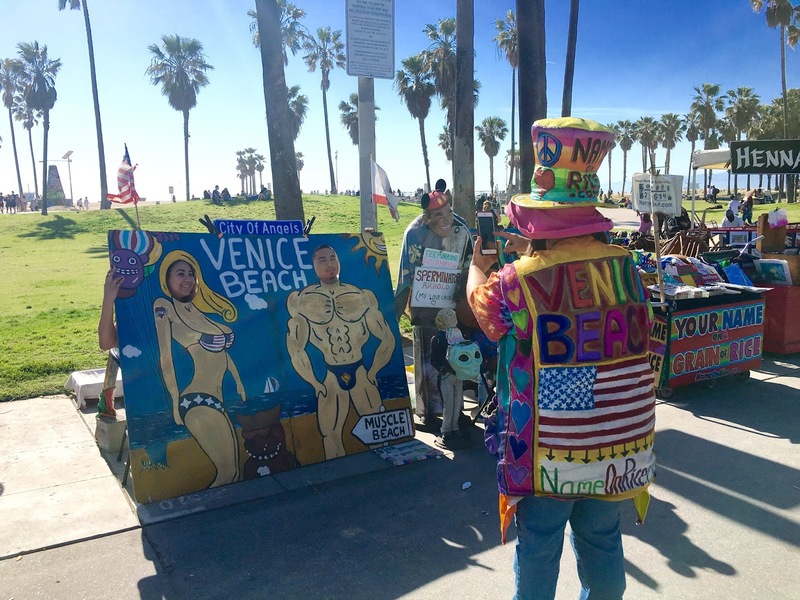 We all love Venice, but nobody wears it on their sleeves like Vivianne Robinson. 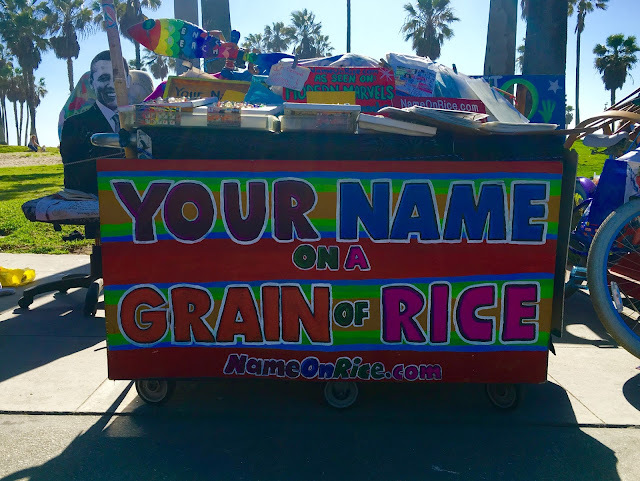 She can be seen most every day on the Venice Boardwalk at her booth Name On Rice, with her top hat and technicolor dream coat brightening the day of everyone passing by. 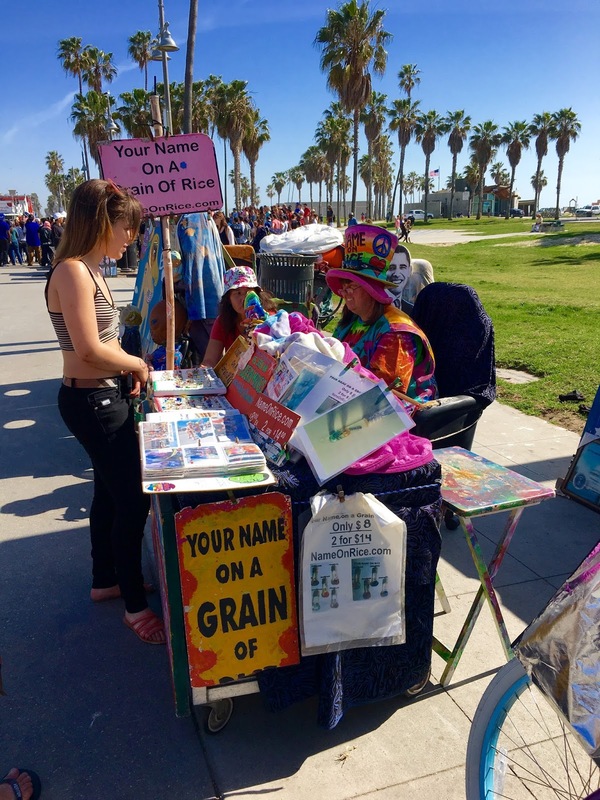 Robinson has been out there writing names on rice since 1994, but it was only yesterday that I finally got to sit down with her and watch her spin her Venice magic. Robinson was born in Venice, and lived in a house that was torn down to make way for Westminster School. She used to hang out at The Gashouse with her beatnik parents, and loved the Venice Pavilion covered in graffiti, and was sad to see that go ("That should've been a historical landmark." Totally true and agree.). Her love for Venice is palpable, and she retains a sense of wonder that she lives and works here, even though she has for all of her life. 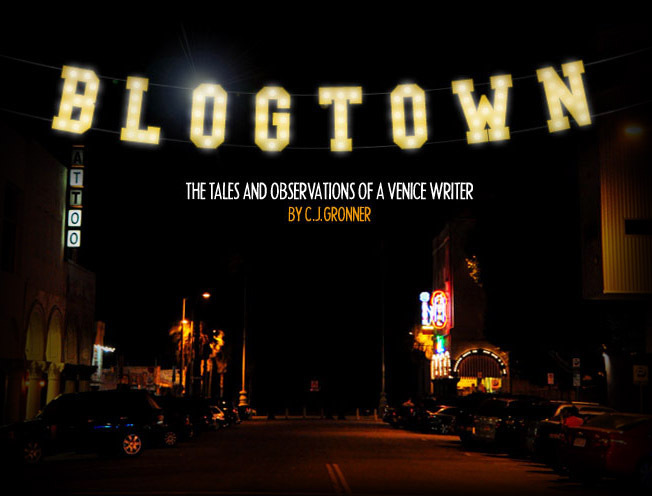 "Who would think I'd end up working right where I started? ", mused Robinson, but I can't imagine her anywhere else. But that would be wrong. Robinson's favorite thing to do - aside from charming all the tourists that come to the Boardwalk - is travel. She has worked hard all of her life to be able to see the world, and is and has always been attracted to the places and events that involve the entire world. Things like the Oscars, where Robinson can be found on the red carpet in full Oscar memorabilia regalia, posing with tourists and celebrities alike. Things like the Olympics, which Robinson loves, and makes plans to attend every four years (in full USA Uncle Sam gear). She already has her event tickets for Rio this Summer, and I was getting Olympic fever just listening to her talk about it. "It's all about the whole world," she explained. Exactly. 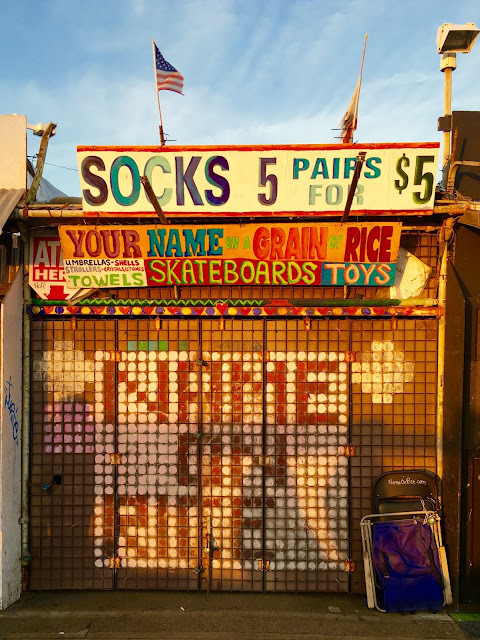 That's why her job writing names on rice at the beach and taking photos of people with her aliens and cut-outs (and owning the stall shop across the way that sells toys, skateboards, jewelry, and all the beachy Boardwalk stuff) is perfect for Robinson - the whole world comes to her. Sitting with her in the fresh air and sunshine, watching all the people come up and talk to her, you get the idea that Robinson really has it about all figured out. 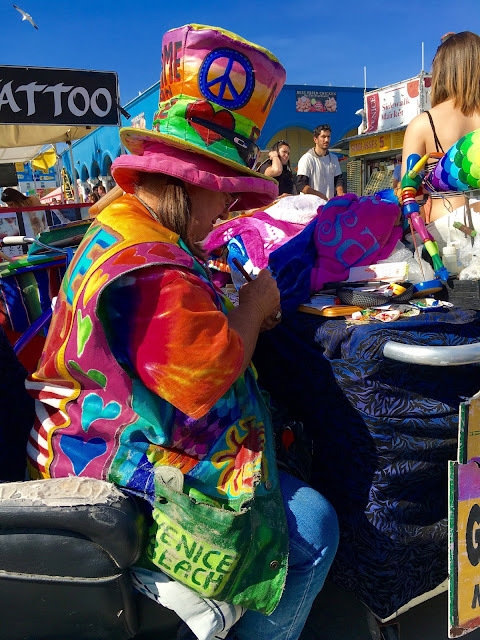 She's so welcoming, so positive, and so lovely, each person left their interaction with her with an extra spring in their step, as she smiled and said, "You gotta give people good memories of Venice Beach ... that's what I want when I travel." And really, that's how you get world peace, if you want to get macro about it (and I tend to). Robinson went to SaMo High, and majored in Recreation at Cal State Long Beach. She took odd jobs doing anything she could to satisfy her travel bug, and soon took off to traipse all over Europe. 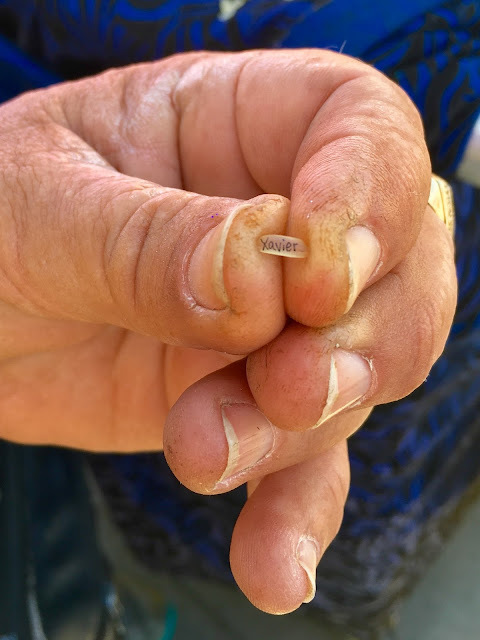 While in Portugal, she came across a man from India writing tourists' names on tiny grains of rice. He showed her how to do this ancient art, and after about a year of practicing, Robinson got it down. She thought it would be the perfect way to be outside, visiting with people from all over the world, and give them something that would bring them both good luck and a happy memory of their time in Venice. It was a hit, and soon Robinson was putting her own flourish on it, putting the little grains of rice in little bottles adorned with a flower, a shark tooth, a little something to brighten up the necklaces that the people leave proudly wearing. She uses regular old Uncle Ben's long grain rice, because as the girl waiting to have five names written on rice said, "Uncle Ben's is the best." Robinson uses a tiny fine point marker and a super practiced hand to write the names, and it's pretty impressive. She even gets orders online (Nameonrice.com), and was about to ship one off to Louisiana as we spoke. She's probably more famous than the famous people that impress her. "Look at all the famous people that come to Venice," said Robinson as she proudly showed me her photo album full of her with various celebs that have come by and posed with her - and it's pretty much everyone (though her favorite is Andrea Bocelli). Some of them might be cool, but none of them are featured on the big Rip Cronk mural on Speedway, where Robinson permanently stands vending her good vibes. (She can also be seen featured on Modern Marvels on The History Channel). 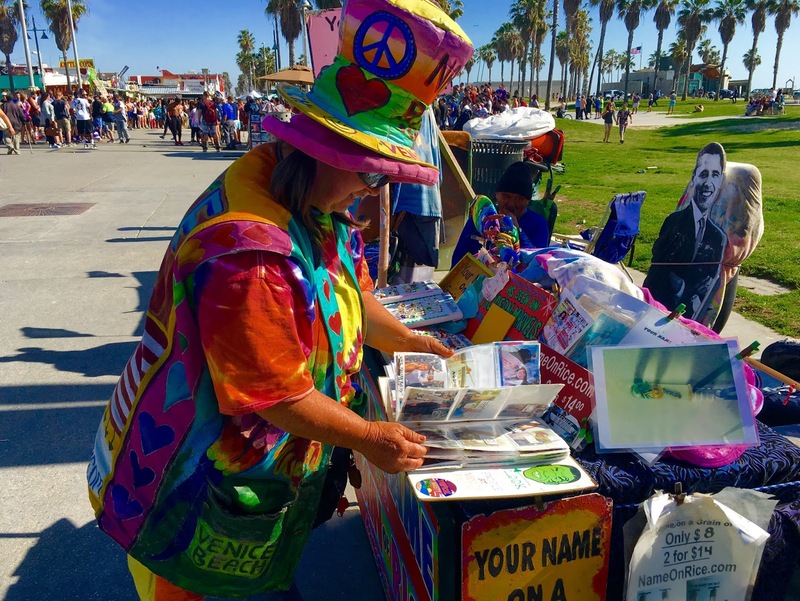 "Yeah, people like to take my picture," she says casually, adding that she also has a YouTube channel, where "Anything that happens in Venice is on there." Robinson really is nothing but good vibes. A guy named Junior sat with us and kept repeating, "She's a really good lady" over and over. He was totally right about this sort of Godmother to all the Boardwalk vendors and performers. Every word out of her mouth was so positive and grateful and all delivered with a real sense of a kind of awe that she lives her life here - even though she always has. "Just look around, how lucky we are! ", exclaimed Robinson. 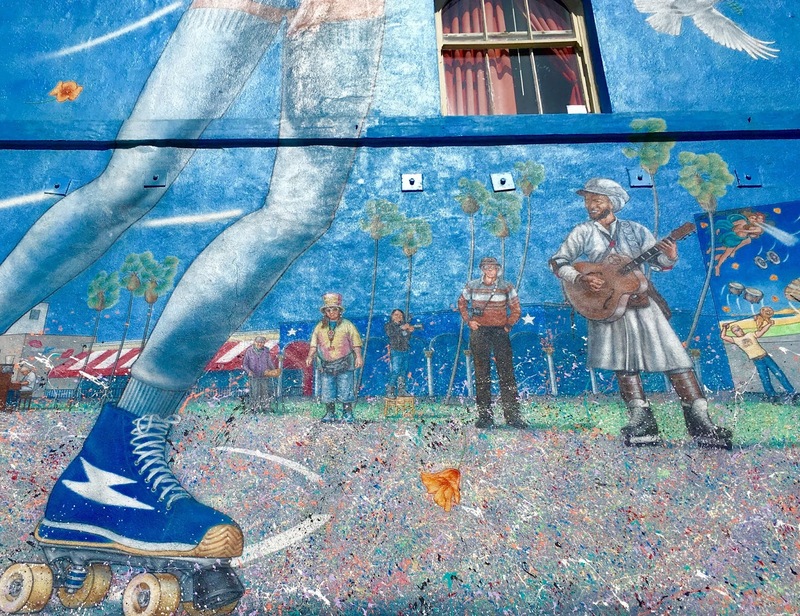 "There's not many places in L.A. for people to walk and enjoy themselves ... and maybe buy something," she said with a laugh, but that's also true. This is her living, though one that she has recently had to supplement with additional part-time hours bagging groceries at Gelson's in Santa Monica to make the ends meet, which she says is a workout. "Change is a part of life, you gotta go with the flow. Be flexible, be positive, and just enjoy everything you can out of life. The last few years there have been more changes here than I've seen in my entire life. I've never seen stores go out of business or people having to move away. But you have a choice, you can be happy or you can be depressed." Robinson very clearly chooses to be happy. "I just love to be outside. At the Boardwalk everyone dresses the way they want to be. Everybody's happy, you just watch the world go by. Every week I take a new picture of the art walls, I love doing that. I love art and all the murals. I love to paint. I love colors and to be colorful. It's all a learning process in life, and we all learn from each other. It's all about fun!" We sat and thought on that for a moment, really just enjoying being exactly where we were, when Robinson said, "Oh, there's my Mom!" and here came her adorable Mom, Odile Robinson - the Beatnik! 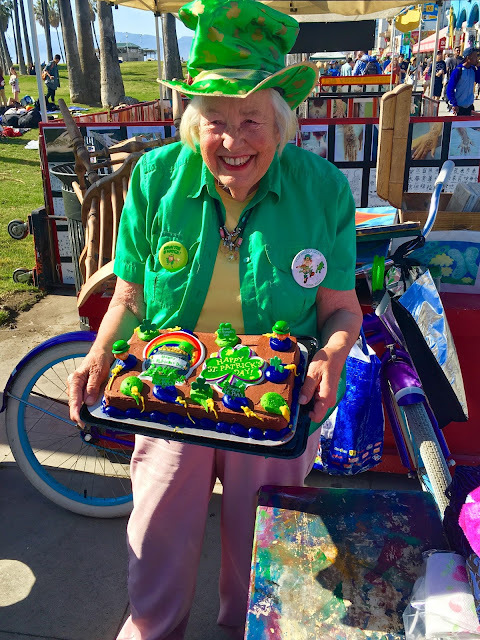 Odile was all decked out in green for St. Patrick's Day, carrying a shamrock-festooned cake, which she proceeded to cut and deliver on little holiday plates and napkins to all the vendor friends that surround her daughter's Boardwalk Empire. "Vivianne is unique, one of a kind. There's nobody like Vivianne," Odile told me, while beaming with pride. Just like Venice - unique, one of a kind, no place like it. Golden hour was setting in, and all of us sitting there just felt so lucky in the moment. "It's the best place on Earth, isn't it? ", said Vivian. Odile chimed in with, "And she knows, because she's been everywhere!" So that's settled. 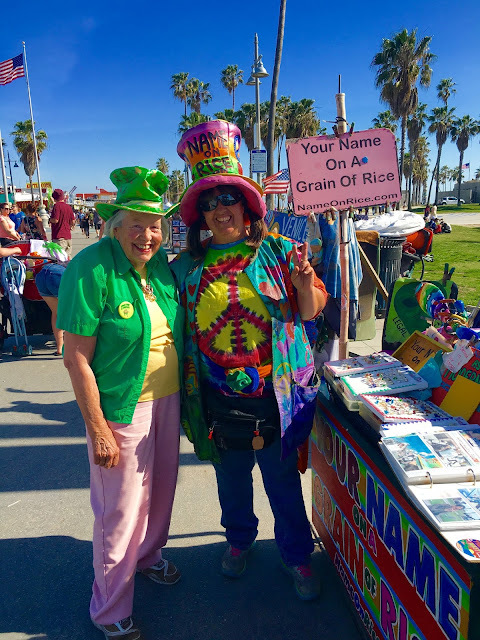 Venice is the best place on Earth, and Vivianne Robinson is about the best ambassador we could hope to have, as she spreads the good vibes and positivity here and everywhere she goes in this whole world that she loves. Check out wonderful Vivianne and Nameonrice.com most every day on the Boardwalk between Windward and Market - or online anywhere. And look for her in Rio! Thanks so much for blogging about Vivianne (my cousin) and seeing the pictures of her and my aunt Odile. They are both very special people!! Vivian is friendly and welcoming. I still remember her after I meet her in Portugal in 1994. She is unique.